Women in Finance Charter – Smashed it in 2017 and looking forward to 2018. As the go-to place for women to manage their financial services careers and for financial institutions to collect the gender dividend / recruit more women E2W is, of course, keen to support any initiative that leads to the increased representation of women, and therefore, our members in the sector. When the then Economic Secretary to the Treasury, Harriett Baldwin, asked us to help and support in the roll out of the Women in Finance Charter, naturally, we were delighted to help. We also thought we should lead the way and sign the Charter ourselves, sharing our own commitments. We were already at an advantage as our management team was 75% women so making a commitment to remain at that level, as required by the Charter, was easy. We wanted to stretch ourselves, though, and so, also set a target to support 200 women to advance, continue or return to careers. Combining all these successes means we have met our targets and measurably helped move the diversity needle. We are proud to be one of the firms helping accelerate change. In 2018 we have set more aggressive targets: to help and support 400 women. 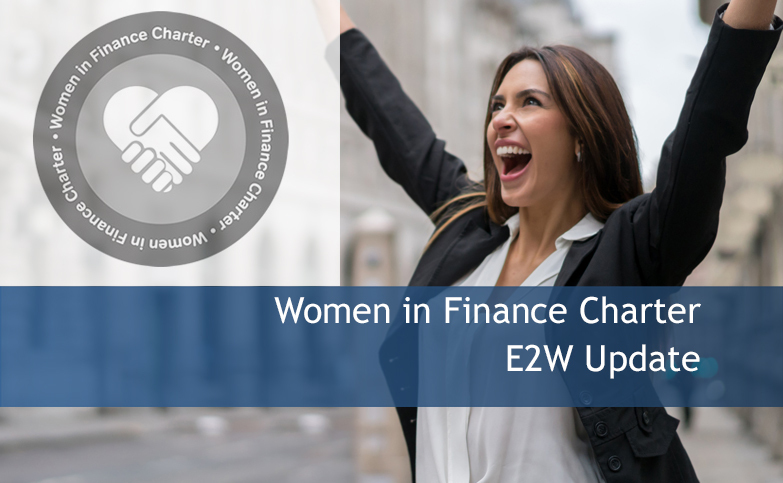 So, if you are a woman working in financial services, as an E2W member, you have access to a range of opportunities with E2W. If you are a financial institution that needs help to recruit more women, then E2W can guide you through our recommendations. Talk to us about how we can help with recruitment and the implementation of diversity recruitment strategies. If you would like to discuss any of our successes with us, please contact Mark Freed. Why not come on the gender diversity journey with E2W? We’ll help you smash your targets. E2W was in demand during 2017 as a growing number of institutions recognise that benefitting from diversity, requires changes to the way they recruit. regulatory and compliance experts at our partners. Interested? Why not talk to Kerry about our latest roles or Mark about helping you recruit more women. Launched in 2017 our Business Teams have become a core benefit to our members and focus on Technology, Front Office, Regulation, Compliance/Regulation and Risk. Risk – three lines of defence to Changes in Risk: What will risk look like in the future? Business Teams also often have a personal development focus with the last Front Office Team meeting focussing on ‘Breaking down the barriers’ and the Risk Team held a panel discussion on changes to Risk and what skills will be required in this sector in the future. To sign up for a future event, click here; to read about past events, click here. Our E2W Coach, Rhian, has years of experience and her vast knowledge has proved invaluable to those wishing to advance, continue or return to careers in financial services. She has helped members position their skills and experience, advised on maximising the impact of CV’s and coached members preparing for interviews. She has also helped members build confidence and executive presence to gain their next role. it’s always worth speaking to our coach Rhian. Alternatively, please review our coaching packages - Rhian will be happy to discuss anything with you. We are delighted to have been consulted by members on a range of topics from help me position myself for my next promotion, interview practice, negotiate my package, etc We have held many career conversations with our members to support their aspirations and development. At different stages of their diversity journey institutions rely on E2W for best practice advice. To reach targets like 50/50 by 2020 is no easy task but that’s what some of our leading clients have set as targets and are on-target to meet. Recommendations from Our survey into members experiences in the recruitment process and our Recruitment Strategies for Financial Institutions to Meet Gender Diversity Targets have been taken on board by many clients to enable them to reach targets. We actively work with clients to help them implement diversity recruitment strategies that make recruiting a higher proportion of women a reality rather than an aspiration. Talk to Mark about our Diversity Recruitment Consultancy Services for our Partners. We have run a programme to support young women into careers in the industry. Our widely read newsletters, blogs and LinkedIn posts have helped educate and inform.